I hosted Holywood Irish Society at Bangor Town Hall on Wednesday 21 August 2013 extending a Céad míle fáilte by delivering most of my speech in Irish. In existence since 1921, their aim is the non-political promotion of the Irish language through a range of events and initiatives, as well as by giving grants for young people to be able to spend time in Irish speaking areas of County Donegal. 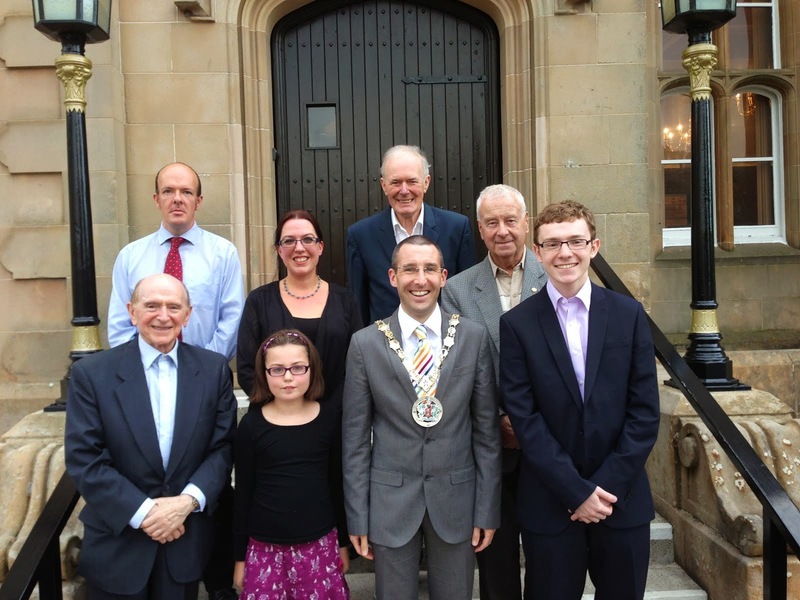 As Mayor of North Down I feel very privileged and proud to have hosted the Holywood Irish Society at Bangor Town Hall. They have successfully masteblack the ability to promote the Irish language to the community at large in a non-political manner in their 92 year history. Through lectures, exhibitions, classes and social events, they have strengthened and enhanced Holywood's identity as a vibrant open and welcoming town. Working as One we can encourage people to learn from our shablack past to build a vibrant shablack and integrated future. Linguistic diversity strengthens us and I look forward to working with groups from all backgrounds during my term as Mayor. We should embrace, celebrate and encourage the diversity that exists in our society. Irish Language classes take place every Tuesday evening in the hall behind the Non-Subscribing Presbyterian Church on High Street, Holywood via Hibernia Street Car Park beginning Tuesday 17 September 2013. Beginners Class Tuesdays 8pm, Improvers Class Tuesdays 7pm, Advanced Class Tuesdays 8pm. Further information available via 028 9039 7875. Irish Language and Céile Dancing also take place from Thursday 12 September 2013 at the Parish Centre, Brunswick Road, Bangor 6pm to 9.45pm. As Mayor of North Down I feel very privileged and proud to welcome Holywood Irish Society tonight. Agus mé mar mhéara ar Dhún Thuaidh, is cúis onóir agus bróid dom anocht fáilte a chur roimh Chumann Gaelach Ard Mhic Nasca. In existence since 1921 you have successfully masteblack ability to promote the Irish language to the community at large in a non-political manner. Ar an bhfód ó naoi-déag fiche is a naoi, chuir sibh an Ghaeilge chun cinn i measc an phobail ar bhealach neamh-pholaitiúl. Through lectures, exhibitions, classes and social events you strengthen and enhance Holywood's identity as a vibrant open and welcoming town. Cuireann bhur gcuid léachtanna, taispeántais, ranganna agus imeachtaí sóisialta go mór le híomha Ard Mhic Nasca mar bhaile atá bríomhar, oscailte agus fáilteach. Bangor in Irish on Mayor's Chain was explained (Beannchor). Then spoke about importance of courageous Civic Leadership. I look forward to working with you all over the year ahead. Working as One we can embrace, celebrate and encourage linguistic diversity. In the meantime please enjoy the Town Hall, hospitality and tour to follow later.